Wearable payments startup PureWrist has begun taking pre-orders for a bracelet equipped with a prepaid MasterCard account which lets its wearer make NFC payments at any contactless terminal with a tap of the wrist. The company showcased the product during its StartupPitch180 presentation at Money20/20. 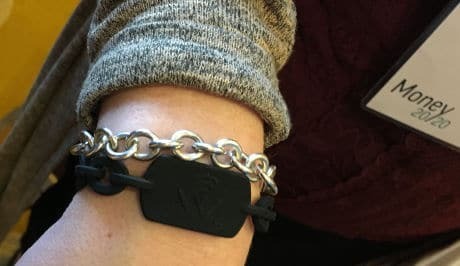 The US$49 bracelet contains a reloadable prepaid card with funds loaded and stored in the account through an online portal on the company’s website. A “very small” monthly subscription fee is charged to the owner of the bracelet to keep their Gratitude account activated and functioning, and a fixed monthly portion of all proceeds from the usage of the bracelet is then shared with charities. “There’s a special connection that we have with our jewellery — jewellery has more meaning than your typical pair of jeans or button-downed shirt,” co-founder Ari Gardiner told NFC World. “Based on my background and experience coming from the wristwatch industry, we exploited the concept that everyone wears accessories on their wrist.